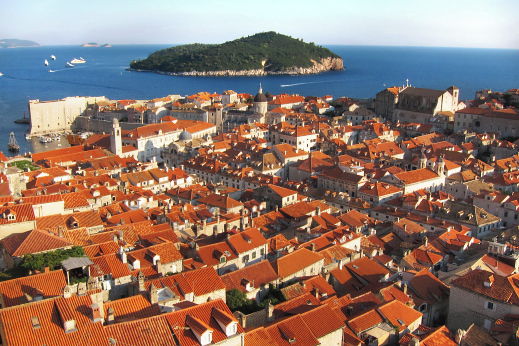 Start in Dubrovnik, the pearl of the Adriatic and one of the most impressive Mediterranean cities, second only to Venice. And yes, Games of Thrones is being shot here! Visit the astonishing Bay of Kotor, considered to be one of the most beautiful bays in the world. Spend the night in the UNESCO town of Kotor, dubbed Small Dubrovnik due to its magnificent old architecture. Heading inland we take the most scenic route in Montenegro, an old Austrian road that leads us high up into Mt. Lovcen National Park. Get acquainted with friendly locals and their mouth-watering local delicacies, such as air-dried prosciutto, aged cheeses and superb brandies. A quiet backroad perfect for cycling brings us to the old capital of Cetinje, once a home of the kings. From here a river leads us to the vast and impressive Skadar Lake, which is a nature reserve and a paradise for bird lovers. It feels like being at the edge of the world. From the luxurious views of the Adriatic coast to the wild and pristine beauty of the Montenegro mountains. Cycle the Kumovi mountain range and finish in Kolasin, Montenegro’s premier outdoor center and home to arguably the best cevapcici in the country (grilled minced meat similar to shish kebab). Enter the wild canyon of the Tara River, which is Europe’s longest canyon abundant in untouched nature. 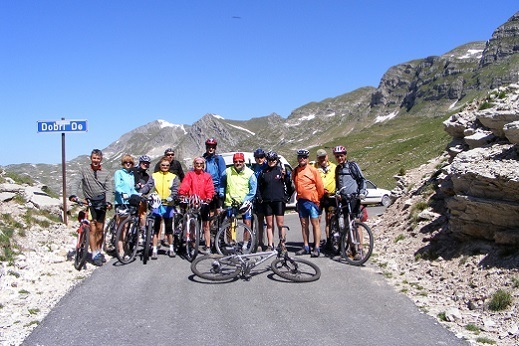 Cycle past centuries-old Christian Ortodox monasteries and meet the local communities. 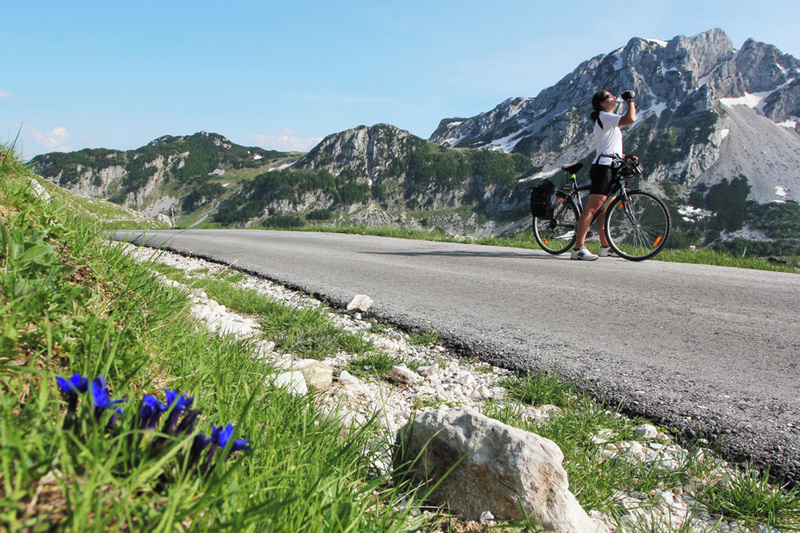 On a bicycle or inside our comfortable van make your way up to Durmitor, Montenegro’s famous national park that offers some of the most pristine mountain scenery in Europe. Cross Durmitor National Park on a smooth mountain road with mind-bending views all around and enjoy the long downhill to the canyon of the emerald Piva River. You are now in the heart of the wild Balkans. Learn how to make and drink proper Balkan coffee in a dzezva, enjoy delicious farm-to-table food, make friends with hospitable locals and learn how to cook the best grilled meat, following a local recipe. And yes, veggies taste fantastic here as well. See our Blue & Green Istria Cycling Tour or Cycling highlights of Slovenia Tour. Meet your guide in Dubrovnik in Croatia for a short trip overview and to meet your fellow cyclists. Transfer to Montenegro and visit the town of Kotor, which dominates the eponymous bay and is also referred to as ‘Small Dubrovnik’. We explore the narrow medieval alleyways and take a short walk to the city walls towering some 600 feet above the sea. Kotor is protected under UNESCO and widely considered to be one of the most beautiful bays in the world. Prepare your bikes for a warm-up afternoon ride along the coast. 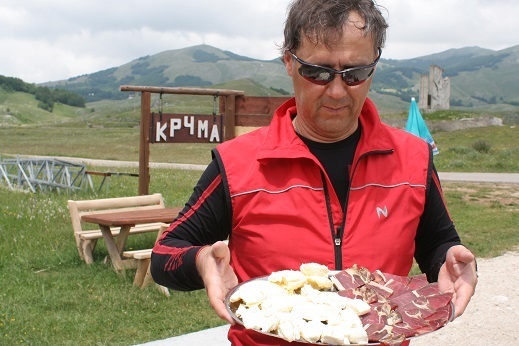 Tasting local specialities – sheep cheese and air-dried prosciutto. After a hearty breakfast we start cycling along the coast to warm up before the (optional) challenging climb towards National Park Lovcen above the Bay of Kotor. The mountain road takes us from the coast to the village of Njegosi, situated at the foot of Mt. Lovcen. This village is the birth place of Nejgos, Montenegro’s greatest poet and monarch. We stop here for a lunch with the locals and to taste the village’s main speciality: air-dried prosciutto and local wine. In the afternoon we continue to ride around the national park and are rewarded with unforgettable views over the Bay of Kotor in the golden hour around sunset. Tonight we sleep in a Konak, which was a traditional dwelling during the time of the Ottoman Empire and has a natural spa in its back yard. Accommodation in the National Park. 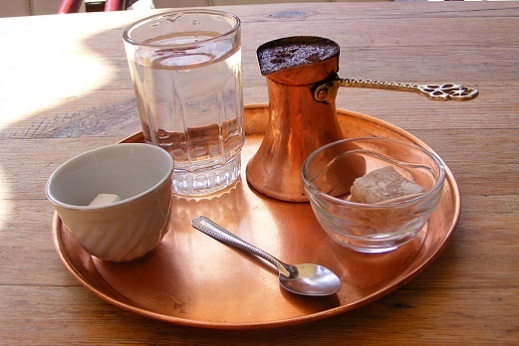 Try the “Turkish” coffee, traditional way of serving coffee in Montenegro. This morning we continue to ride through the hundred-year-old beech and pine forests until we leave the national park to continue toward the town of Cetinje. This old royal capital reached its peak during the reign of Petar II Petrovic Njegos, whose residence, called “The Billiard House”, still stands today and is open to visitors. After a short stroll through this unique historical spot we continue to ride on beautiful and remote countryside roads. 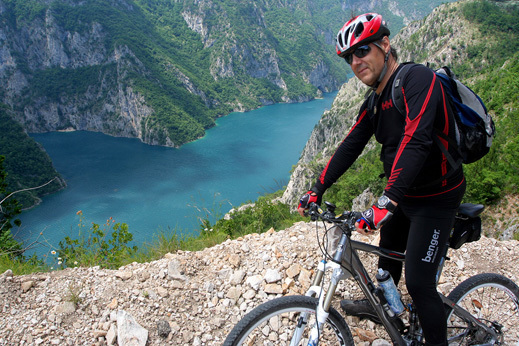 This eventually brings us to the Rijeka Crnojevica village and the coast of the large Skadar Lake, which is rich with bird life and forms a natural connection between Montenegro and neighbouring Albania. 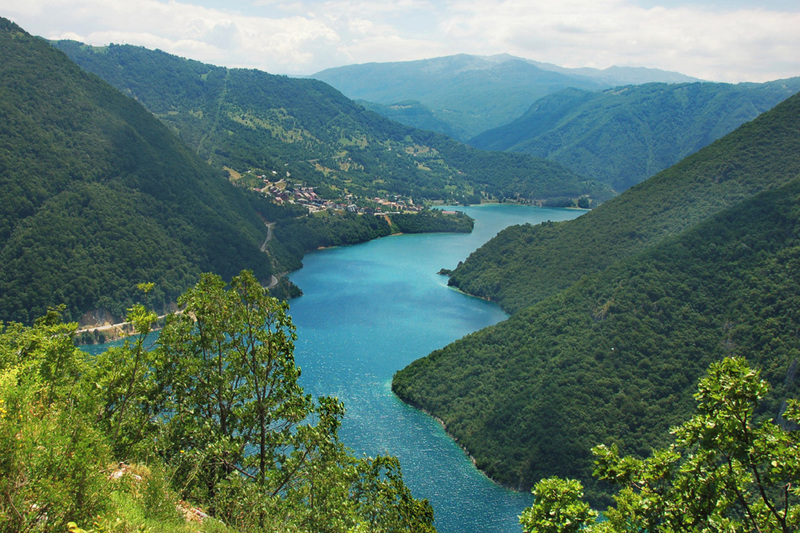 Wild and pristine nature of Montenegro. This morning our van takes us from Skadar Lake to Bioce, bypassing Montenegro’s capital of Podgorica to avoid having to cycle on dangerous heavily-trafficked roads. We start the day’s ride in the wild mountain scenery of Bioce. First an optional long but gradual uphill climb on a remote countryside road brings us to the top of the plateau, offering beautiful views over the mountains. Along the way we stop for some refreshments and a picnic lunch in the shade of old walnut threes. Our goal today is to reach the town of Kolasin, a winter ski resort and the adventure capital of the country. Cycling along the Tara River Canyon. 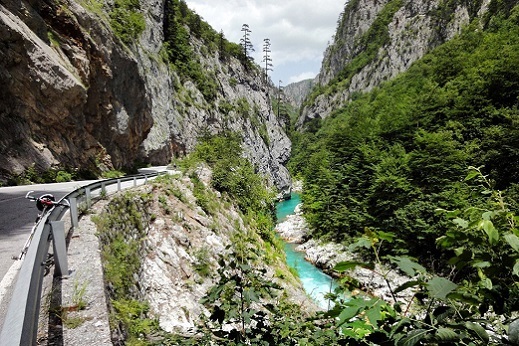 From Kolasin we enter the spectacular Tara River Canyon, which is the deepest and longest one in Europe. A breathtakingly scenic ride through the canyon brings us to Durdevic Tara where we leave the main road and start climbing up to Durmitor National Park (optional). The landscape here is an unexpected cross between Patagonia and Tibet, with a truly epic feel to it. 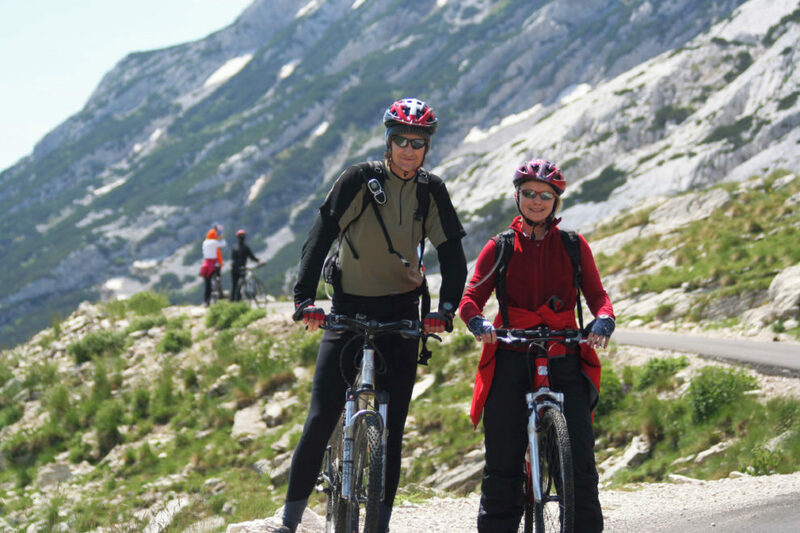 We end our ride in Zabljak, near the lovely Black Lake and under the mighty range of the Durmitor mountains. Zabljak is also a well-known ski resort in the winter time. Day to relax or optional easy ride or hike. 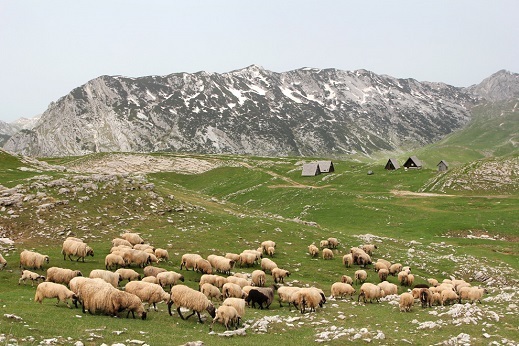 Zabljak lies at the foot of the Durmitor mountains and is a perfect starting point for today’s adventures. 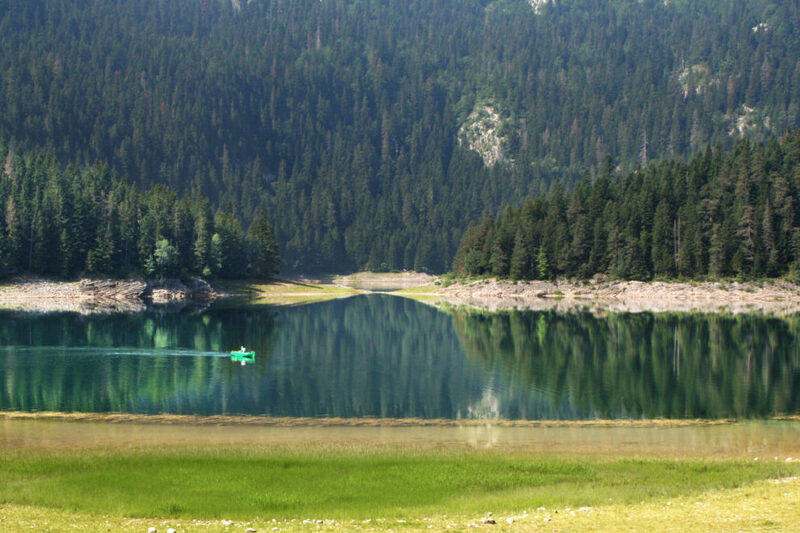 You can explore the side roads of the Durmitor plateau by bicycle, or go for a hike in the pine forest. 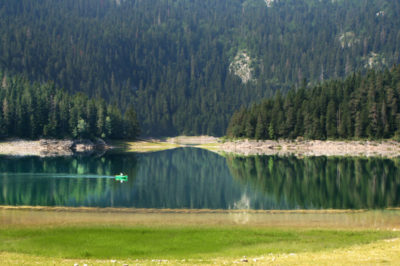 Durmitor National Park offers untouched nature and lies in the heart of the Balkan wilderness which gave shelter to Tito’s partisans during the Second World War. The Black Lake is a short walk from the center of Zabljak, where you can enjoy the views and try a traditional local specialty, tender goat meat made “under the bell”. Views of Piva River Canyon. According to our guests, today’s ride is probably the most spectacular one. As our starting point is already high in the mountains (at 4900ft/1500m) our day will be fairly easy. We will traverse the Durmitor National Park, riding on a scenic mountain road which eventually brings us to the canyon of the Piva River. There we turn in the direction of Pluzine (optional shuttle up the hill), where we spend the night. DAY 8 Rudnice – Ostrog monastery – Dubrovnik. End of tour. From Rudnice we cycle all the way to Ostrog monastery which is carved into a limestone rock, attracting visitors from all over the world. From Ostrog we transfer to Dubrovnik, where we end the tour.